How do I use time blocks? Time blocks can be set to make scheduling much faster. Rather than choosing the start time, end time, and a break duration in three separate steps, time blocks allow you to choose all three from a preset list and apply it in just two clicks. These can be set for specific locations or they can apply to the entire organization. 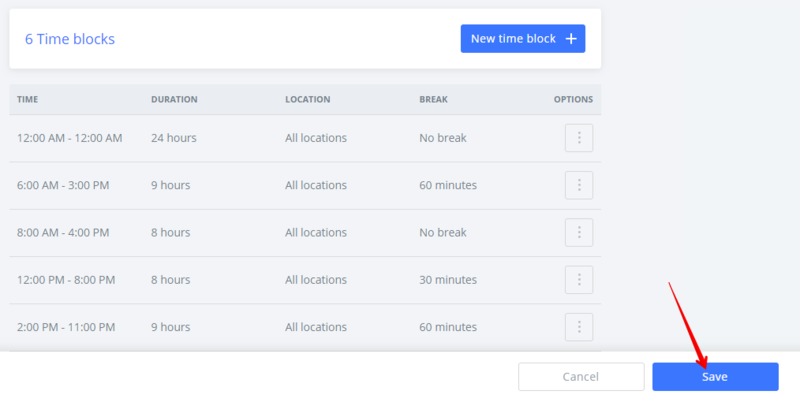 Note that assigning a location to a time block means that an admin or manager has to be assigned to that location in order to see it as an option when scheduling. To set up your time blocks, go to Dashboard > Settings > Time blocks. Click the New time block button. Next, add the details. For example, you might have a "mid" shift that always runs from 12 PM to 8 PM with a 30-minute break. Leaving the location blank will allow this block to be used at any location. You can also choose to hide the end time for a time block. When you're done editing, click Add. Once you have your time blocks saved, you can select them when creating new shifts or editing existing ones. 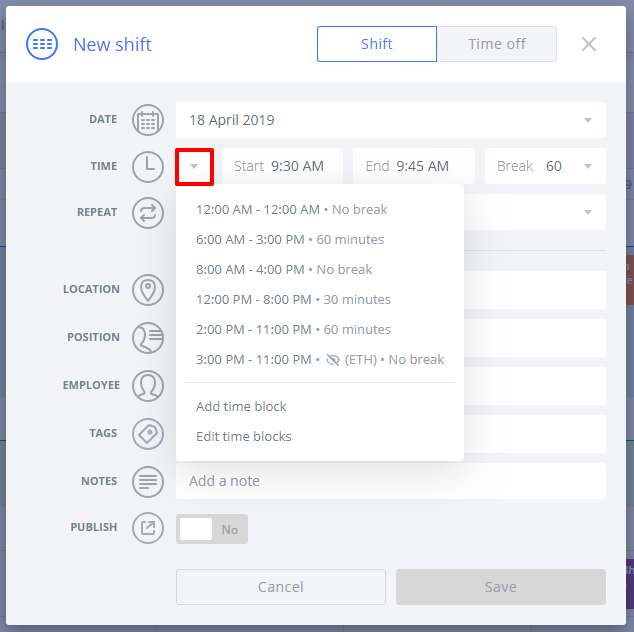 You’ll notice you can also edit and add new time blocks right from the new shift window. You can also edit any of the details (start time, end time, or break) as needed.